Calling all plant parents, current and expecting! 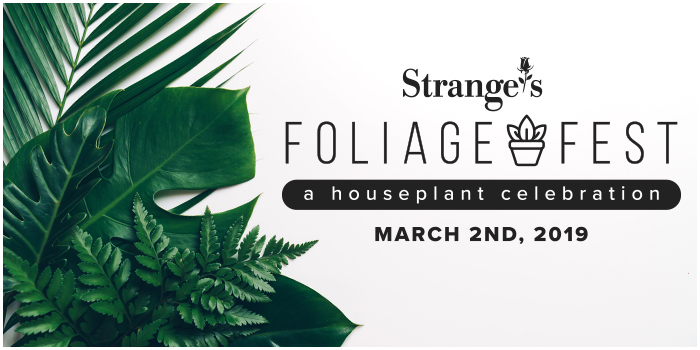 Join us on March 2nd as we celebrate all things houseplant with a day of workshops, free classes, sales, and more. We’ll also be offering free repotting with purchase of a pot for new and old plants alike! Be one of the first 100 attendees and receive a FREE spiderette (spider plant baby)! We will be offering free houseplant repotting with purchase of a pot for the duration of the event. Show the world your Foliage Fest fun and win a FREE 6″ Amazonian pitcher plant or 4″ intergeneric orchid!! Simply tag @strangesrva and use the #strangesfoliagefest hashtag in a single Instagram post by 11:59 PM on Sunday, March 3rd for a chance to win. One post tagging Strange’s AND mentioning #strangesfoliagefest = one entry. Multiple posts do not constitute multiple entries. Each entrant can only win one prize. 6″ Amazonian pitcher plant and 4″ intergeneric orchid constitutes separate raffles – you will automatically be entered for both with one post. Only posts made between 3/2 and 11:59 PM 3/3 will be entered. Winners will be tagged in a post at 1:00 PM on Monday, March 4th and messaged to come pick up their prize. Learn the ancient art of bonsai from the roots up. We’ll cover some of the basic techniques such as wiring, training and pruning. We will also give you hands-on instruction planting your very own bonsai tree to take home. Workshop is $15 per person & includes instruction + all materials (plant, soil, pot). To reserve your spot please call (804)360-2800 or visit our West Broad reception desk. Class caps at 15 people. Payment due at time of class. Are you a collector, an enthusiast, or just want to know what that plant is popping all over your Instagram feed? We’ll share some of our favorite new and exciting houseplant varieties currently taking the world by storm. Always wanted to build your own terrarium but have no idea where to start? We’ll show you how it’s done so you can walk home with your own Insta-worthy terrarium! This workshop will guide you through best planting practices, what plants to use, and how to care for your new miniature garden. Workshop is $25 per person & includes all materials (container, soil, charcoal, rocks, moss, & terrarium plants). To reserve your spot please call (804)360-2800 or visit our West Broad reception desk. Class caps at 20 people. Payment due at time of class. Drop in any time between 11:00 AM and 3:00 PM to mold your own hypertufa container, a classic choice for succulent and miniature gardens! Limit one container per person. Join container expert Susan Frakes as she shows you how to make a great miniature garden for indoors or outdoors you’ll be proud to flaunt on Instagram. She will guide you through the best plants to use, tools you’ll need to get started, and other great tips and tricks. Join us as we give a crash course in the wonderful world of houseplants. We will cover areas such as fertilization, watering, common pests & problems, and interesting varieties. We’ll go over all of the varieties available to bring color into your home. Everything you need to know about light requirements, special care instructions, and what will work for your environment. Join us for a crash course on succulents as we help you traverse watering needs, fertilization, potting, exactly how to propagate, and more. You’ll also walk home with your very own succulent garden so you can put all your newfound knowledge into practice! Workshop is $20 per person & includes instruction + all materials (pot, 3 succulents, assorted moss/rocks). To reserve your spot please call (804)360-2800 or visit our West Broad reception desk. Class caps at 20 people. Payment due at time of class. Does your mouth water at the thought of lemons right off the tree? It’s easier than you think! We’ll cover general information on light requirements, fertilizing, common insect & disease issues, and the differences between varieties. You’ll be puckering up for fresh fruit in no time!